The no-dig method of growing, which is exactly as it sounds, has gained a lot of press over the last few years. Traditional digging is the consequence of translating commercial agriculture to the garden setting. In fields of many acres, where efficiency and time restraints are pressing, 'digging' (or rather ploughing) with a tractor makes sense (leaving aside the obvious debate of what this actually does to the soil's integrity). But in the garden efficiency and time pressures are less of an issue and work can be conducted at an altogether more leisurely pace. So how, exactly, should we go about starting off a new vegetable bed in time for spring sowing? Surely you'll need to dig in this instance, if only to get rid of the weeds and set the plot off onto a good footing? Well, no actually. As I'm about to reveal there is an easier way that requires significantly less hard graft – just plenty of well-rotted organic matter. The main reason you'd think it necessary to dig a new growing bed is to get rid of those pesky weeds that you're sure to be faced with. But rather than dig them up, we're going to smother them. Annual weeds and grasses are short-lived and have few reserves. Deprive them of light and they'll soon throw in the towel. Perennial weeds may be tenacious and seemingly unconquerable, but even they can be snuffed out if smothered for long enough. When covered and denied light, most annuals will give up the ghost after two to three months, while perennial weeds such as couch grass or bindweed may take up to a year. The point is this – it's only a matter of time before your weedy nemeses are extinguished and there's no need to lift so much as a fork! The first job to establish your no-dig bed is to look at what's growing there. If you're lucky enough to have mainly annual weeds then the job is simplicity itself. Hoik out the few clumps of perennial weeds that exist (nettles, docks and so on) then cover the entire growing area with a thick layer of organic matter, about 10cm (4in) deep, simply piled right on top of those weeds and grass. The organic matter can be anything that's well-rotted and available in quantity: garden compost, bought-in compost or very well-rotted horse manure would work equally well. It needs to be laid thick in order to give the weeds it smothers little chance of growing through and reinvigorating themselves. If you are worried about weeds reaching the surface then extra assurance can be had from laying cardboard over the weeds before applying your organic matter. Make sure the cardboard is the sturdy brown stuff used for transporting goods and generously overlap the sheets to make the base 'watertight'. Give it a water then shovel on your organic loveliness. Some weeds are harder to get rid of than others; a hopeful layer of compost isn't going to shake off the likes of bindweed. For areas matted with tough perennial weeds you will need to go heavy-duty by smothering them with a landscape fabric such as Mypex. Chop down the weeds or hack them to ground level (a great way to relieve any pent-up frustration!) then lay down a layer of organic matter before capping with your landscape fabric. It does need to be landscape fabric because this will allow rain to penetrate to the ground below, keeping it lubricated for the worms beneath to work their magic. Light can penetrate some landscape fabric, so if you can see that after a few months the perennial weeds below seem to be stirring back to life, cover the landscape fabric with wood/bark chippings to exclude every last shard of light. The fabric will need to stay in situ for up to a year, although you can always lift a corner to check progress after several months. If you want to use the area while it's being cleansed lay growbags or containers on top and plant into these. You can also grow widely spaced vegetables such as pumpkins and squashes in the soil itself. To do this cut a (small!) planting hole into the fabric and set young plants into the ground. You will need to religiously watch these holes, removing the slightest trace of weed root and leaf as soon as it appears, but with plants such as these requiring 90-120cm (3-4ft) spacings you shouldn't find this too taxing. I've successfully cleared small areas of ground using this technique and can personally vouch for its success. You might say my refusal to dig is a symptom of laziness; I'd say it's commonsense and a reflection of why it's sometimes worth questioning the norm! New beds that have been mulched with compost can be left to settle for a few days before being planted up. 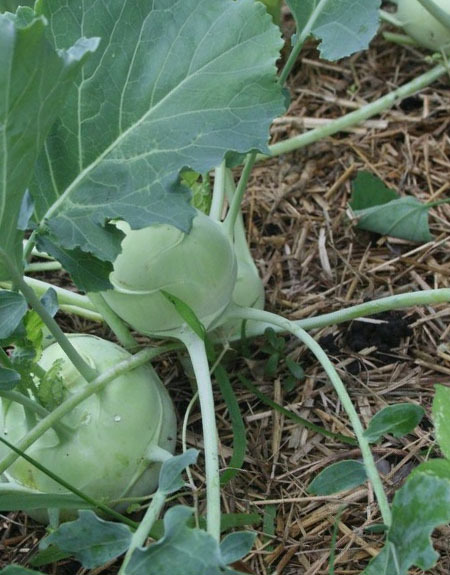 If the organic matter is lumpy or not quite as friable as you'd like, aim to plant out module/cell-raised vegetable seedlings that will already be part-established. You can also create a more agreeable sowing medium by topping the organic matter off with a sowing-depth-layer of finer material. In this way you can fill the bulk of your bed with rougher material that may be more readily available, while eeking out your quality compost. Another alternative is to line seed drills with this finer material before sowing and back filling with the same. Once your beds – established using either method – are properly underway you can, if you wish, use traditional digging techniques to maintain them. The only trouble with this approach is that it risks bringing up fresh weed seeds from further down in the soil profile. Better is simply to top up your beds between crops with an additional layer of compost, about 2cm (1in) deep or more. That way your ready army of diggers (aka worms!) can do all the hard graft for you as they burrow up to the surface to feed on the fresh organic matter that's been deposited. All this should encourage you to think twice before reaching for the spade. Just because this no-dig method is so understatedly simple, doesn't mean it won't work! "I have been square-foot gardening in raised beds using the method you described for several years. It couldn't be easier and more productive. My vegetables (mixed in with insect-loving flowers) make a beautiful and healthy garden. Just add the compost, plant and reap--no weeds, no digging--what a perfect way to garden!! Wish I could send you some pictures I recently took of winter greens--kale, beets, arugula, lettuce and swiss chard." "Okay...but it just looks so hideous. I would not like to look at a pile of rubbish just because it has something growing on it...nor would my neighbors! That cardboard by the curbside looks awful! Some ideas are not always worth pursuing...besides, I enjoy gardening as much for the exercise as for pleasure.%"
"Even with 4 inches of mulch, I've had grass and weeds grow through. I think this works in places where the climate is conducive to growing things. But in an area where the weeds are tough enough to survive on their own (no rain for months, but humidity. Major heat in the summer. intense sun) -- you've got to dig them out over and over and over again. The cardboard might work, I've never had the patience or cardboard to give it a try. I am thinking this might work, somewhat, on an established bed, though. Though burmuda grass is tenacious." "DR-T, the cardboard will be covered with organic matter. It's merely a base layer to quash the weeds - a bit like carpet underlay! The cardboard trick works particularly well for raised bed projects as it can be cut to size to line the base of the bed." "Hello, All. We are in Illinois and last fall decided to expand our veggie garden to give our tomatoes and friends some new soil. Since I read all sorts of bad stuff about using Round-Up on to kill the lawn, we used weighted-down heavy cardboard over the winter to do the job. This was recommended on several organic gardening sites. I haven't peeked yet, but I am sure the grass is dead. Should I just plant through the cardboard, using compost in the planting holes and mulch on top? Or should I remove the cardboard and lightly dig in the dead grass? Thanks in advance for your advice." "Geri, You are definitely right to avoid using Round-Up or any other herbicide. Yes, I would recommend planting through the cardboard, adding compost and mulch as required. This assumes you are putting part-grown seedlings in. If you are planting seeds then you need to plant directly into soil and the grass may need a little longer to have completely died before the soil is ready to be uncovered - so you could peel back a little and take a look, or could use containers or bags of seed potting soil on top to start them off before transplanting them as Ben suggests in the article." "In Australia, well, where I live in Queensland, weeds are rampant. I have incredibly fertile soil and in my area we have intense heat in Summer and high precipitation. I used to be an old school farmer and want to make everything pretty and weed free. This year, I made weeds my friend. I noticed that weeds actually supported my tomatoes and other vegetables. They created shade in incredibly hot weather. The "blue tops" actually added colour and looked like I had planted a field of lavender. The weeds were companions and attracted bees which is excellent for pollination. They were not strangling or depleting the soil as I had learned growing up. I saw that they were actually a companion in my garden and useful- not all of them mind you. But its quite fascinating to me that after 1 very hard and difficult season on my land, these weeds saved many of my crops and changed my age old aversion to them." "Geri, another option is layering the compost, manure, mushroom compost then mulch, hay or straw on top of the cardboard and plant directly in that. The cardboard is not only good to kill off the grass but also attracts earthworms. Eventually it will break down and become part of your soil. Adding mushroom compost to my soil has worked wonders if you have a mushroom farm nearby, you can get large bags cheaply. It should be watered in well and covered with hay or straw or whatever you use for mulch. Cheers!" "What about for a medium to large scale (1/2 acre) backyard garden/urban farm? We're planning on turning our big backyard from grass to crops and I'm not too particularly excited about tilling up a half acre of grass and then trying to stay ahead of weeds all summer long..."
"a half acre is a good size to maintain. Is your land flat or sloped? and how do you plan to irrigate? another consideration is pathways and roads. if you have a mill nearby you can use sawdust on your paths or plant creeping herbs or flowers for a ground cover. on our farm we crop-terraced the slope to slow water flow and erosion. then we broadcast french millet across the terraces. it is the rainy season here and millet loves water. I also use the millet as feed. but you can cut it early and use it as a green manure crop. planting some kind of green manure crop that grows quickly will help cut down your weed population by outgrowing most. this has worked really well for us. then plant what you want. remember, in order to maximize the nutrients to the soil, cut the millet before it seeds. enjoy! " "Thanks for the info Sandra. It is a sloped yard and we plan to use drip irrigation. We're in central Iowa, and still in a prolonged drought, and the outlook is that the drought will continue and probably worsen this summer. " "We turned our back lawn into a square foot garden plot, though it is not a half acre. Perhaps you can work on one section at a time. We put down cardboard to kill the grass, then put our boxes (two 4 x 4, one 2 x 20, and one 6 x 4) with at least 3 feet between for walkways. Be sure to put wood slats 12 inches apart, so it makes it easy to know where to plant each vegetable or flower and how many for a square foot space. We put down wood chips in the paths that we got really cheap with our pick-up truck. We filled the boxes with compost (make ourselves)--but NO SOIL. That way you have no weeds--just fill boxes, plant seeds, water and harvest--what a deal!! You need the boxes this far apart to use a wheelbarrow, and just get between them with ease. I made a grid pattern on Microsoft Word to use as a planner--that way I know just where I am going to put the seeds. It has all worked great." "I've been doing no-dig gardening for a while now. Many farmers have switched to no-till farming and most have given up the plow and practice some type of minimum tillage. Just like in farming you'll notice a yield drag for the first few years unless you fertilize a lot due to increased microbial activity taking up the soil nitrogen (decomposing the mulch). However, after 5 years or so it starts giving back. Also it take a bit to get earthworms up in numbers but once they do you get their tilling. Also, years of digging or roto-tilling can cause a compaction layer deeper down. It may take a few years for this to break up (by the earthworms) or you may need to use a deep-rooted crop to break it up." "This year I decided that I would turn both my allotments over to no dig sites. I have 10 raised beds in which I follow a no dig policy and several fruit cages which are simply manured and have been mulched with a product called Struch- this year I have taken the plunge and strulched both plots after digging in copious amounts of soil improver as I garden on very heavy clay. I have been advised not to add anything to my soil now for several years by other plot holders- yet my instinct is to add more fertility to the ground. If I do add more improver, well composted vegetation, do I add it on top of the Strulch so the worms can take it down over the Winter or add in Spring?" "Hi Joyce. I'd be inclined to add compost as and when, as you can't 'overdose' with standard allotment-made compost. If you add it in winter the worms can take it down during the colder months, giving a good start to the new growing season. Add it in spring and it will help to suppress weeds while also feeding the soil. I'd maybe go for a compromise - add it very late winter, a few weeks before the first buds break. However, it really doesn't matter too much when you add compost to the soil - it's all good stuff!" "I suggest that you NOT use any of your clay soil in the gardening--just compost that you make yourself, if possible. That way, you don't have to worry about amending the soil--the compost has lots of nutrients for the plants. I have used NO soil for several years and my garden in awesome--just add the compost to fill up the square I'm currently planting." "I have just finished covering 1 of 4 new veg plots with some cow muck, its not rotted at all yet. I have covered with 6-8 inches over the grass and weeds there. I want to start using it next spring will it have all rotted down by then? I will add well rotted again in fall. This is my first time using the no dig thank you." "Hi Jean. It would have been best to keep the cow muck in a pile to rot down before covering over the ground for your new veg plot. However, as you leaving it a whole year and covering the muck over with well-rotted material in fall, I think this should be fine. If you are creating further veg plots consider adding all the well-rotted material in fall or winter. This will still give enough time for the worms to 'dig it in' for you before planting begins in spring. The problem with applying organic matter now is that the rain in the next 12 months could wash out a lot of the goodness from it in the meantime. But I think with the addition of material in fall you should be fine. Let us know how you get on - it sounds like an exciting project." "I've had good luck using newspaper instead of cardboard. I lay a layer down of 4-6 sheets then cover with another couple inches of soil/compost, then a layer of mulch. The weeds are smothered, the newspaper disintegrates and I have a nice layer of planting material ready and waiting for me. This takes a few months before it's ready, but it sure beats digging out those awful weeds." "Hi Donna. That sounds like a really good method. Newspapers are also readily available, which makes them a good, convenient alternative to cardboard. As you say, it certainly beats weeding!" "What about slugs and pests....."
"Hi I have an allotment plot measuring 30 x 30 feet. I'm intending to put 10 raised beds. I was wondering if I could fill the raised beds with about 9 inches off well rotted horse Manure and still be able to plant directly on them next spring. My plot has been covered with a black fabric and I was going to put the raised beds over the covers and fill them up with 3 years rotted manure. Can I plant directly on the well do ted manure. " "Hi Khalid. It depends what you want to grow. Some plants, such as squash and potatoes, can be grown directly in very well-rotted manure, but the nutrient rich content of the manure may cause some plants to struggle or grow in peculiar ways - for example carrots can fork if there is too much manure. Salads I would imagine should grow well in well-rotted manure. If the manure is truly well rotted - to the point of being compost - you should generally be fine with most crops." "Hi Khalid and Ben - I know you can grow tomatoes directly in "well rotted" manure too - Black Kow shows a video of doing it directly in a bag of their product. Last year I tried it and it worked! Ben - thanks for the tip on carrots forking if too much manure, I didn't know that!" "Hi - I live in Christchurch NZ and I've decided for the first time in many years not to dig. I put pea straw over the garden for the duration of the winter, and now as I plant out the seedlings grown in my greenhouse, I'm excited to see so much worm action very close to the soil. Should I also be adding other material (blood and bone, compost?) to the soil? This garden bed has been used for a few years now and we try to rotate where we plant stuff, and have always dug in compost every year. I'm not sure if I should be lightly digging in the pea straw before I plant, although it is serving as mulch very well. I'm just separating it into rows so that I can plant stuff, hoping that it's going to be rich enough for the plants to grow. " "Hi Kiwigardener. As well as a mulch of pea straw, I would probably have added a good layer of compost on top of the soil before covering it over. I'd go ahead and plant under the pea straw mulch, then top up with a layer of compost once the crop is finished. You could add a general purpose organic fertiliser to the soil - tickled in with the tines of your fork." "We have used the raised bed no dig method for nearly 6 years now in our community fruit and veg garden and had fantastic results. The soil is still like fine breadcrumbs and thus very easy to weed. We have never trodden on the beds so the soil isn't compacted and therefore never needs to be dug and the yield has been great. It started out as a neglected patch of chalk downland and now the garden is full of beneficial insects and vibrant." "Wow Pauline - you paint a vivid picture - your gardens sounds amazing!" "Thanks for this blog post! Last year, I took on an overgrown allotment plot riddled with couchgrass, thistles and bindweed as well as many annual weeds! We started by digging over four large beds of 3m by 3m removing weeds and creating a fine tilth. However, as soon as the little plug plants were in, we found the weeds quickly overtaking them. We have since covered paths in between with weed suppressing membrane and bark chip and I'm hoping this will stop some of the spread. After reading this and considering the poor and heavy soil on the plot, we will definitely be layering with cardboard and organic matter over the winter. Would you reccommend just removing larger weeds such as thistles and covering the rest with card, compost and mulch for 6 months before planting in April/May next year? " "Thanks, Ben. Have done what you recommended,and all looks very healthy. Am passing on the no-dig method to family and friends but it seems so hard to change the age-old 'you have to dig the garden over' mentality! " "Hi Anwen. I'd remove as many of the most obvious perennial weeds as you are able. Then mow the rest to the ground before covering over with card - ideally a few layers. Then add your organic matter. The important next step is to remove any trace of perennial weed that makes it through as soon as you spot it. Keep on top of them and they will eventually give up. I had this problem with bindweed and did this - and eventually won, so hang on in there!" "Hi Genevieve. Thanks for letting me know. Good luck convincing everyone else of this technique. Once they try it they'll be converts!" "Are rats and other pests a problem when using landscape fabric to smother grass and weeds (either to eat the dead plants or live under)? They might be able to easily get under the cover unlike when you smother the weeds with cardboard then a layer of compost." "Hi Al. I have never experienced a problem with landscape fabric and rats, though I suppose in theory they could tunnel around underneath. If you are in any doubt then do use cardboard, but I wouldn't imagine this would be a problem to be concerned about." "Thank you Ben. It's good that you didn't encounter any issue with landscape fabric and rats." "No way! Do NOT get rid of nettles and dock! That's food, right there! Cut them back by all means." "Reduced labour, but pricey unless you have access to a huge amount cheap compost and manure. It is effectively a raised bed of good growing medium. I have grown good lettuce, spinach etc and even toms on a 4inch raised bed of compost on a concrete path. -This can't fail! " "You are right Sandy - this method is more cost effective if you have a supply of compost and/or manure readily to hand. But once you have the system up and running it isn't as demanding." "I have had some funny looks from some of the "old-timers" at the allotment when filling my beds with card followed by a very thick layer of manure! However, I am convinced this is the best way so will let you know my results... I just have a question about watering. Are the beds on top of clay soil - card, rotted manure then straw likely to dry out quickly? I have heard that they may need daily watering in dry weather! " "Clay can dry out quicker, but with all that manure this should really be an issue, as you'll be planting into the top of it. Nevertheless, you may need to see how you get on and be on hand to offer extra watering should it prove necessary. Certainly, given time, no-dig gardenings improved with lots of organic matter require significantly less watering than traditional beds." "Hi...i would like to use the no-dig method to create an new flower border currently in an area of long grass...can i use grass cuttings in the mix?...should this be under or over a cardboard layer and then well rotted manure/mushroom compost? ...i'm on a no money budget and i have rather a lot of overgrown lawn to tame and several plants in pots waiting to be re-homed...so how soon can I plant them out...i'm in a milder part of UK....thanks "
"Hi Julie. My solution would be to add the cardboard (a couple of layers deep if you're able) on to the grass, then put your planting material on top of this. If you have lots of grass clippings I would just add these in one layer on top of the cardboard, rather than mixing in through your growing medium. Or use clippings as an organic mulch on top of the compost surface once you've planted your plants - this will help to suppress opportunistic weeds and keep moisture locked in. As for the growing medium, well-rotted garden compost would be great, or well-rotted manure (but do make sure it's very well rotted). Manure may encourage lots of leafy growth over flowers. Good luck with it!" "thanks Ben...yes it was the issue of grass and manure/compost re: flowers rather than veg..as no dig means no soil in the short term but i guess the worms will do the 'heavy lifting' over time...thanks julie"
"Yes, given time the worms will do all of the digging for you - handy creatures!" "Hi Ben, Having recently moved to Rainbow Beach, Qld, I'm in the process of putting down 6 raised beds to grow some veggies. The main problem here, of course, is that we have no soil, only sand. I've got lots of cardboard (removalist boxes) that I intend to line the beds with and fill up with compost, soil, etc but what about worms?? Also, I haven't seen many bees around! Having come here off a smallholding outside Brisbane which had abundant rich soil, and beehives, I'm at a bit of a loss as to how to go about it. Any advice would be very welcome. Linda P. "
"Hi Linda. How exciting to be starting off new raised beds! I wouldn't worry about worms - they will eventually find their own way into the beds once the cardboard has rotted down, and probably even before that. With regards bees, it's well worth planting a flowers to attract them. You can get some ideas from other articles written on this blog. There are articles on attracting pollinating insects. I'm sure there are plenty of bees out there - they just need coaxing into your garden!"